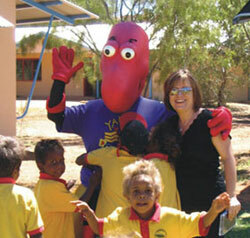 An Alice Springs-based teaching student is set to record a CD with children’s television icon Yamba the Honey Ant, after penning songs about bush tucker, healthy living, the environment and safety. Charles Darwin University Graduate Diploma of Primary Education student Julie McAllan is already an established country singer, having performed around Australia, in the US and most recently at the Katherine Country Music Muster. She decided to seriously turn her hand to children’s songs earlier this year, after starting the practical teaching component of her CDU degree at Yipirinya School, where she is employed tutoring Indigenous students. “With my past practical teaching, if we had a particular theme with a unit of CDU work, I’d make up songs to help learn about that unit. I tried some new songs I wrote out on the Year 2 kids at Yipirinya, many of whom have learning difficulties and some who’d never been to school before,” Julie said. 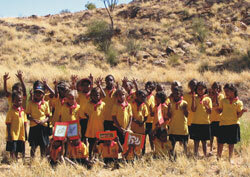 “I tested my ‘Bush Tucker Counting’ song on them and various ones who had difficulty counting up to 10 can now do so. They loved the song and that was a good sign to me that I was on the right track,” she said. Julie’s songs are gaining popularity with more than just her class. This week, Imparja Television will be airing an episode of Yamba the Honey Ant which features Julie’s songs as part of a birthday celebration for children’s character, IMA Safety House. Transplant Australia is now sponsoring a professional recording of Julie’s ‘Healthy Body Song’, to be performed by Yamba and friends at the Staying Healthy Expo Family Fun and Education Day at Blatherskite Park in Alice Springs on 3 June. Perhaps the biggest coup for Julie will be a children’s CD of her songs to be produced with Yamba for release in time for Christmas. “I really want to use it as an educational basis for kids, especially those with learning difficulties. Working with kids at Yipirinya has been a real eye-opener for me and I’m learning a lot from them as well. “Indigenous kids really take notice of what Yamba says so these songs will be able to reach kids in not only the Northern Territory but in other states,” she said. Listen to one of Julie's songs. You may have to download Windows Media Player to open this file.